What happened to September? It just seemed to start and now here we are in October and I haven’t even started thinking about moving my part time houseplants back indoors. There was not a hint of frost at any time during the past few weeks so I was still actively working on my garden renovations and ignoring the passing weeks. I also, obviously, did not send an issue of “Dallying In The Dirt” in the middle of September as I would normally have done. I can either garden or write about gardening but apparently not both. The Hibiscus, the few Cactus and the warm weather Orchids need to be finding their way into the warmth of the Solarium fairly soon. 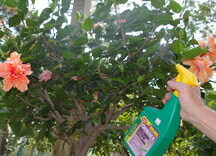 This means some regular spraying in an attempt to eliminate the spider mites and other pests that may be lurking on those plants. Those pests will multiply rapidly once they get inside away from any predators and where they will enjoy the warm dry air. 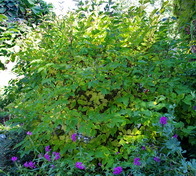 At the front corner of the house is a lovely Lilac named Miss Kim, touted as a dwarf lilac. I have pruned it brutally a couple of times and it continues to recover and defy my definition of dwarf. Almost 2 M (6+ ft) high and almost as broad is not the size I had in mind when I planted it there. I’ve already moved it once because it was too big for its original location. It’s early October and its leaves have just started to turn colour and that makes it the perfect time to find a new home for it. It may be too big to move easily and/or successfully but we are going to give it a shot. My daughter’s big new landscape is desperate for plants so that’s where it will get its chance to show off. If it dies in the process then we are out a couple of hours work. If it survives then she is in by a delightful but not dwarf Lilac. 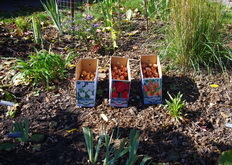 The very hot summer was wonderful for a few crops in the vegetable garden. Peppers were prolific and became a feature of this year’s spaghetti sauce. Making large quantities of prepared meals such as my frozen spaghetti sauce is my way of storing the abundance of the garden for winter consumption. 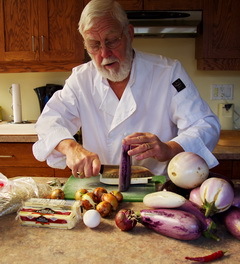 Another great producer this year was Eggplant. They really are beautiful fruit and the pile of various colours, white, purple, and striped were a delight to look at and will be a delight to eat over the winter as I thaw out and fry my little ice cubes of Eggplant fritter batter. They are delicious and have converted several people who used to profess to hating Eggplant. I’m off to Tucson by the end of the week, to attend the annual Garden Writer’s symposium. That will leave the Assistant Gardener in charge of all of the cuttings in the rooting bed in the basement. Geraniums and Bonfire Begonias have been propagated for several years and this year we are going to try the Yellow Impatiens that we bought this spring and that has performed exceptionally well in the rather heavy shade around the deck. 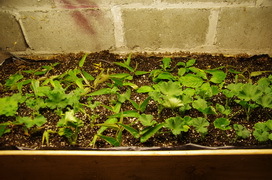 Growing these things under fluorescent-lights in my basement is a great way to do some slightly active gardening during the winter, I can’t ski every day, and the result is a large quantity of new plants to fill my garden in the spring without having to pay top dollar for them. Of course, we don’t count the cost of the fluorescent tubes or the power to run them, that’s just part of the household budget. When we return, the large renovated beds at the front of the house should have cooler soil than they do now and I will start to plant the 600 fresh Tulips that are sitting on the front porch awaiting their new home. There are six varieties that cover two blooming times. The 300 early will be spread evenly across the beds as will the 300 late ones. I spend many moments out there trying to figure out where each variety will go to create the most interesting look in the spring. As the early and late will be intermingled over the entire area I should get an extended Tulip bloom season in these beds. The early ones will open and as they fade after a couple of weeks then the late varieties will start to open and continue the display for another few weeks. As they fade the summer Perennials will fill up the space and the beds will remain in bloom. I also have a “few” Crocus that will get interplanted with the Tulips, in order to get an early start on the spring bloom season. Several hours of planting are in store but the results for the next several springs will be well worth the effort. By the time the first hard frost knocks down most of the tender plants in the garden, I’m usually happy to see them go. There has been one spectacular plant this year that I would somehow like to keep growing but I know it’s time is coming in the next week or so. 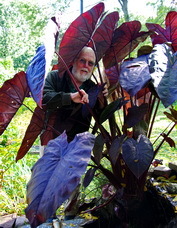 Most days I stand for a few minutes on the back deck and admire my Colocasia. It is a rich dark maroon colour and the growth this year has been amazing. The sunlight pouring through the leaves at different times of the day produces some fascinating colours and textures. It grows in a relatively small basket of gravel that is suspended so that a portion of the waterfall flows through it. That keeps it well watered but since it is the pond water and the pond is full of fish, it is actually a dilute nutrient solution. Two things happen. The Colocasia removes the nutrients, helping to keep the water clear and producing the amazing growth that I stand and admire every day. After the inevitable frost has knocked this beauty down, I will rescue the large tuber and overwinter it in the basement and I will pry off one of the small sideshoots and grow it in a pail of water in the solarium for the winter. Mary Asks? How about powdery mildew on the pepper squash leaves? I picked off the worst of the first leaves I noticed. Since then have sprayed (misted) with a solution of water, baking soda and Murphy's Oil Soap. Will the patch of ground where the squash is this year be infected from now on? Ken Answers! Powdery Mildew eventually knocks down most of our Cucurbit crops but this year its arrival seemed to be very early. The warm spring and hot summer encouraged it as it moved north. It really doesn’t overwinter in our soil but does so further south and makes it way to more northern gardens later in the summer. Joye Asks? We have an old home on Lake Erie. Usually, at this time, some wayward flies waken or come from somewhere and turn me into a fly swatter nut. There have been NONE this year. Also, we are conscientious composters and there have been almost NO little flies eating everything. My question is: how do we compensate for this?? What do I add to help nature along? Ken Answers! We had very few flies this year as well and that may be one of the benefits of the hot summer. Even the fruit flies were very few until they suddenly appeared in great clouds in the past couple of weeks. I don’t think their contribution to the action in the compost bin is that great that we need to worry about its absence. I do find lots of their egg cases on the sides of the small compost that we keep in the kitchen and that keeps me emptying and cleaning on a more regular basis.